March 1st being Shivaratri, Ashram’s Holy Shri Vishwanath temple was agog with worship of Lord Shiva with Vedic Hymns, Namakam, chamakam, rudram, etc. There is archeological evidence to the effect that Lord Shiva & mother Kali were worshipped by the tribes that inhabited Mohen-jo-daro & Harappa sites, believed to be Pre-Vedic period. The oldest among the Vedas, Rig Veda identifies Lord Shiva with Rudra. Mahashivaratri is considered to be the most sacred & beneficial to receive the grace of Lord Shiva. Even the Ganesh purana, other Puranas, Skandhpurana, Padmapurana, Agnipurana, also give vivid accounts of Mahashivaratri. 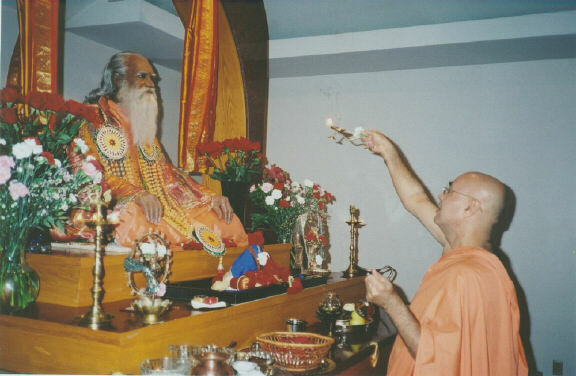 At early dawn in Brahmamuhurta from 4 am onwards, holy offerings with chants of Rudripath, Abhishekamaklaghurudra commenced which continued up to sunrise & first Mangal Arti at the temple was done by worshipful & revered Shri Swami Adhyatmanandaji Maharaj. Again in the afternoon a Laghurudra & Archana were offered at the holy temple between 12 noon to 3 pm. A number of special worships were offered to Lord Shiva from 7 am to 9 am & in the afternoon 3 pm – 4 pm. From 9 am up to 12 noon temple was thrown open for the devotees Abhishek, Archana & puja. In the afternoon 4pm -8 pm there were special darshan of shringar with special temple orchestra with revered Swamiji Maharaj performed Bhasma arati. From 4 pm – 4 am throughout the night there were 8 special pujas & melodius devotional music attracted thousands of devotees in the ashram as usual. Due to being a day of India & Pakistan cricket match, the normal crowd did not turn up until 9 pm, but after winning over Pak in world cup from 10 pm – 2 am, temple was crowded with over 10,000 people. At the invitation of Chandan Thakur, Director of a famous institution of Indian classical dance, Nrutyabharati, revered Swami Adhyatmananda Maharaj, presided over a 1.5 hours experimental program choreographed by senior students. The program, which was organized at downtown town hall, was an inspirational one of culture, character, and the discipline, which was imbibed in students of Mr. Chandan Thakur. In the afternoon of Sunday March 2nd, devotees of Ashram visited Ashrams accredited Yoga teachers Mrs. & Mr. Niraj’s house for a prayer meeting for the departed soul of his mother where prayers were conducted for everlasting peace, Atmashanti & Sadgati of the blessed mother. In the late afternoon the whole team as usual visited its monthly routine trip for the poor feeding – Daridra-narayanas Seva, where about 300 kids were given sweets, fruit, playing bowls, pencil, notebook, etc. 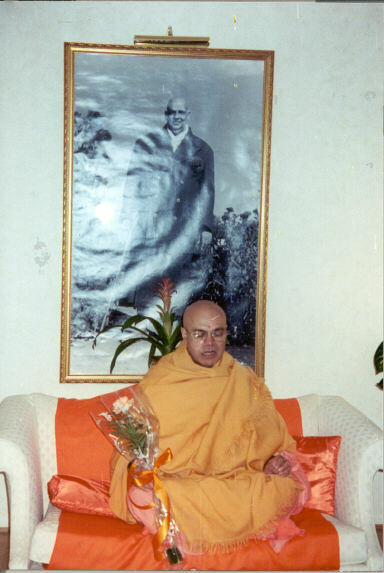 On March 3rd late night worshipful Swami Adhyatmanandaji Maharaj departed for overseas tour. Before his departure board of management & trustees meeting, a special Satsang with grand dinner for Swamiji’s send off was organized at the Ashram. From March 5 – March 7 everyday Yogasana, Pranayama & Mediation classes in the morning & evening satsang were organized at various devotes residence. 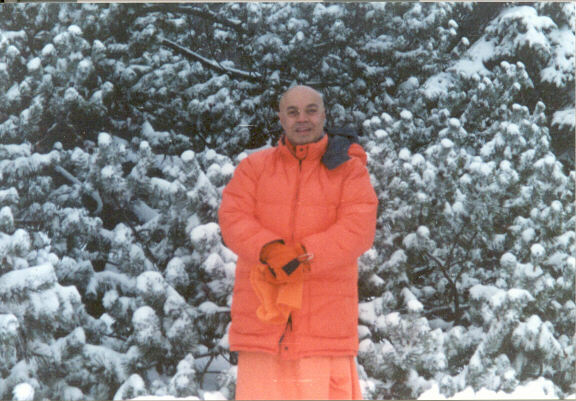 Swamiji left for Cincinnati on March 8, where satsang was organized at residence of Sri. Sanmukah Patel & he requested Swamiji to visit once again so that he can organize a few more public satsang on a grand scale. 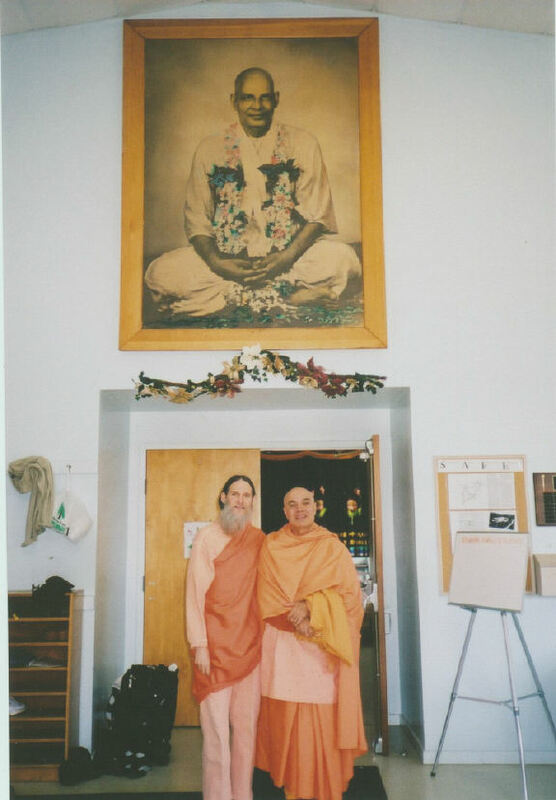 On early dawn of 9th Swamiji was driven to Satchidananda Ashram at Yogaville, Richmond, VA. Most Worshipful & Revered Dayananda Mataji & H.H.Sharadananda Mataji gave warm welcome to Swamiji Maharaj. Swamiji visited Chidambaram & Lotus temple. At dusk a very special Puja was performed by Swamiji Maharaj at the holy Samadhi Shrine of Brhamahmaline Yogiraj Sri Swami Satchidanandaji Maharaj. In the night satsang Worshipful & Revered Swamiji Maharaj’s Mahasamadhi’s video was exhibited. Next morning there was a special meeting & satsang with the newly elected president of the Ashram H.H Sri Swami Ashokanandji Maharaj at Sivananda hall. Both the devotee of Sivananda & cousin brothers of the monastic order meeting was oozing unimaginable love & reverence for each other. 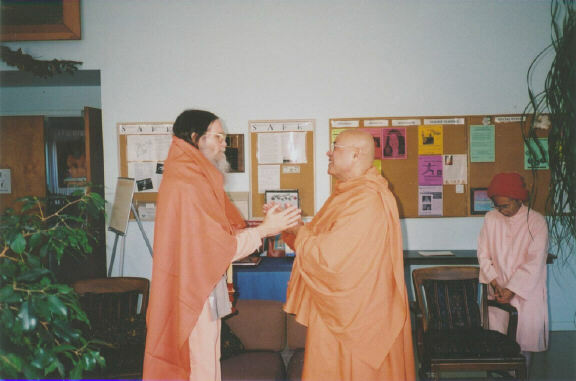 Respected Dinesh Patel of Bloomington Indiana drove Swamiji back to Cincinnati. On 10th March public satsang was organized at a public location specially organized by Patel community at Oklahoma. There was satsang at a devotee’s house also where Sri. Dhiren Patel & Sri. Dinesh Patel were the prominent figures to organize the entire visit to Oklahoma & requested Swamiji to visit again for Srimad Bhagavad Kath. From March 14th – 21st Satsangs & Yoga camps were organized at LA, California with the total dedication, devotion, & enthusiasm by Mrs. Kalpana & Dr. Vinod Rana. All day long introspection & Yoga spiritual retreat was organized on Saturday at Sri Radha Krishna temple in Norwalk. In spite of torrential rain 100 seekers of truth & lovers of Lord attended the program & came from 100 miles radius. 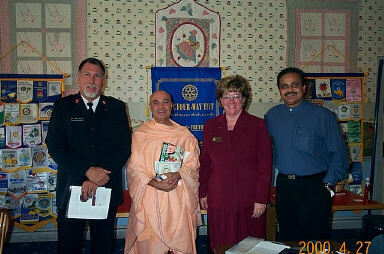 Other discourses were organized in Sanatan Dharma temple, Valley Rotary club of CA & Diamond Bar palace, etc. A special Yoga sharing was organized for international Chinese Yoga federation headed by famous Yoga teacher Mt. Thomas Kaue. Swamiji attended a very special Satsang of the devotees of Sri Sri Ma Anandmayi. There was pressure & sincere request from the Ashram of H.H.Sri Yogananda Paramahamsa also to visit & Satsang, Unfortunately due to lack of time; Swamiji was unable to go there in person. From 22nd to 26th March at Tampa FL at Hindu Temple & Sanatan Dharma temple Yoga seminar was organized in which each morning Swamiji shared his thoughts & gave practical instructions of Stress Management through Yoga, Yoga learning for peace, power & prosperity, Science, Pranayama & healing power of meditation, Yoga for tension in daily life, in which a large number of local Americans & sizable crowd of physicians from American Air force also joined us for Yoga instruction. Swamiji conducted a special program for younger generation also – Asian Radio recorded Swamiji’s talk & message, which were broadcasted for the benefit of those who were not able to reach program venue. All the programs were organized by sincere efforts of Sri Chandrakant Patel. Pujya Swamiji received very overwhelming love and an invitation to come back soon. 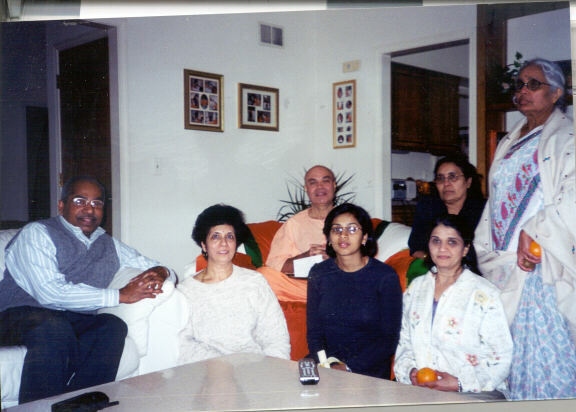 On 26th March afternoon Swamiji Maharaj arrived at Detroit Metro Airport & drove to the residence of Sri Rajesh & Dr. Bina Laungani. Four days Satsang & Yoga programs at Sanatan temple were organized with the collaboration of Sri Anant Dixitji high priest of the temple & Mrs. & Dr. Arvind Mistry. Everyday from 6:30 – 7:30 am Yoga classes were conducted & in the evenings were engaged 7:30 – 9pm with Geeta, Ramayana, & soul elevating discourses. Saturday March 29th an all day long spiritual retreat was organized. 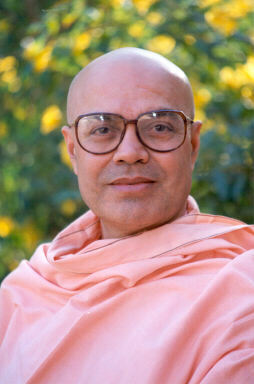 Late evening, Swamiji left for Toronto, Canada. 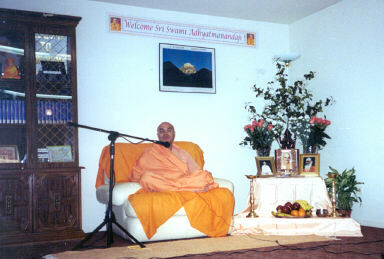 At Toronto Markham, worshipful Swami Adhyatmananda. Maharaj’s discourses were organized from March 30th onwards at Indian Cultural Center, Markham. After visiting Canada, Swamiji Maharaj will be moving throughout the length & breadth of US once again in the states of Michigan, North Carolina, Indiana, and Texas & Illinois. LOS ANGELES, CA - "Prayer is the only answer for peace. Pray frequently. Pray sincerely. Pray from the depth of your heart. Prayer is not asking or demanding anything. Prayer is a bridge between the individual and cosmic soul. No prayers are unanswered, sooner or later all prayers are answered. So pray and pray, night and day; and without prayer do not pass the way." This was the essence of the message conveyed by Swami Adhyatmananda, President, Sivananda Ashram, Ahmedabad, during his recent visit to the Southland. He continues his peace mission "Shanti Yatra" in Canada and UK. 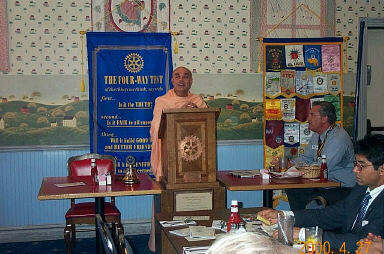 Swami Adhyatmananda a well-known yoga expert in the lineage of Swami Sivananda gave a number of private and public addresses. 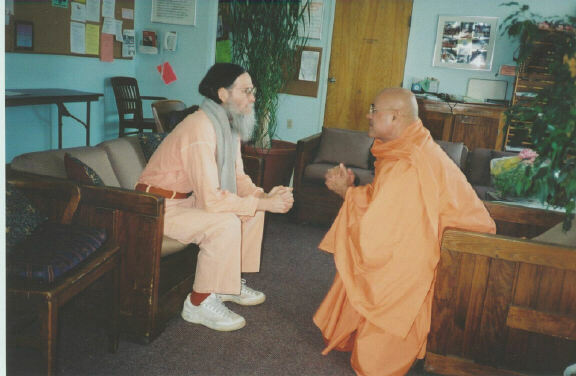 In his discourses at Glendale, Garden Grove, Cerritos, Norwalk, Diamond Bar, Rancho Palos Verdes, at the Sanatan Dharma temple, Radhak-rishna Temple and various Rotary Clubs among others, he told the audiences over and over again that in this time of conflict it was imperative to be clam, quite, give up lust, greed and anger. 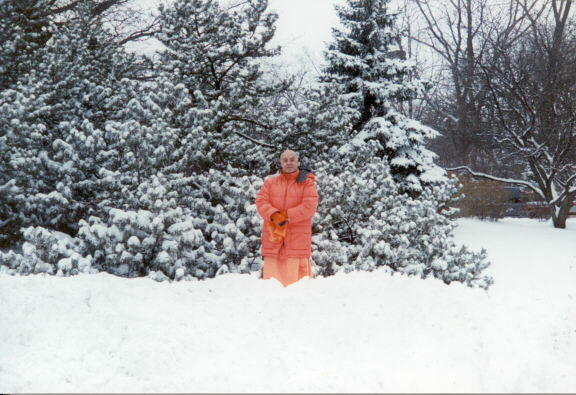 Swami Adhyatmanandaji Maharaj, a monk and renowned yoga and meditation teacher from India, will return to Sylvania’s Hindu Temple, 4336 King Rd., next week for a retreat and classes. 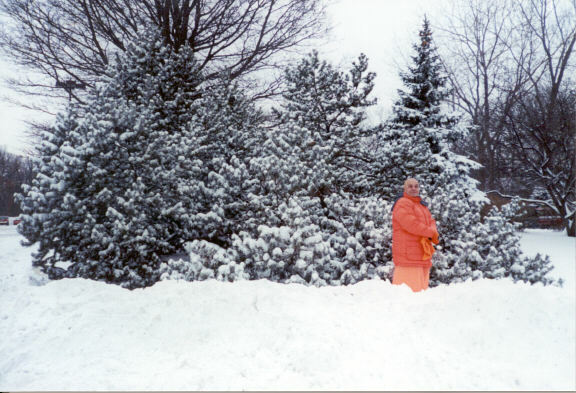 Swami Adhyatmanandaji is known for making Hinduism practical and relevant to modern life. A holy man credited with bringing about a spiritual awakening through his teachings, he has helped young people caught up in drug addiction as well as business leaders seeking greater meaning in their work. On previous visits to the Toledo area, he has given classes for children and talked with adults about improving their parenting skills. While in the area next week, Swami Adhyatmanandaji will give classes on yoga, pranayama, and meditation from 6:30 to 7:30 a.m. Thursday and Friday and from 7 to 9 a.m. March 29. Pranayama is a breathing exercise that is said to cleanse the body of impurities, improve concentration, calm thought processes, and alter circulation by increasing the amount of oxygen to the brain. In addition to these classes, Swami Adhyatmanandaji will give lectures on stress management through yoga from 7:30 to 9 p.m. Wednesday, on "Mrityunjaya Mantra - Life-giving Mantra" from 7:30 to 9 p.m. Thursday, and on "Gita in Daily Life," from 7:30 to 9 p.m. Friday. On March 29 he will give lectures on two shloka, or philosophical hymns, written by Sri Sankaracharya, who lived from 788 to 820. 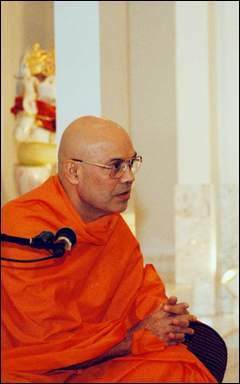 From 10:30 a.m. to noon, he will speak on "Nirvana Shatakam," and from 5:30 to 7 p.m. on "Bhaja Govindam." The sessions will conclude with "Arati," or prayer from 7 to 7:30 p.m. The lectures are free, but a $10 daily fee, or $25 for all three days, will be charged for the yoga classes. Yoga students should wear loose clothing and bring an exercise mat or blanket. Children under 6 should not attend and students will be asked to maintain silence and a prayerful mood. For Hindus, yoga is more than a physical discipline and is regarded as a way of life and means of practicing the spiritual truths found in all religions. At Sivanand Ashram Ahmedabad, on 23rd of March most worshipful & revered Dr. M.J.Patni Saheb acting president of Divyajivan Sanskrutik Sangh a grand satsang, felicitation, Bhandara (Feast) was organized where more than 200 devotees joined for the program. Each Sunday ashram as usual organized Mrityunjajya Mantra from 7 am to 5 pm. As usual on 2nd Sunday of the month about 70 families were served with full months grocery at the ashram. Yogasan camp for newcomer was conducted as usual from March 1st to March 10 by Yoga expert & physician Dr. Snehal Amin. Regular Yogasan classes from 5:30am to 7:00 am, 7am to 8 am, 4pm to 5pm, & 6pm to7pm conducted by accredited Yoga instructors from ashram to Sri Suryakant, Mr. Nitinbhai, Ms Sangita Thavani, Mrs. Janaki & Mrs Yojana Tandon. Yoga consultation & regular medical care through Allopathic homeopathy, nature cure & acupressure attracted 100’s patients as usual by ashrams medical care center. Reike coaching by Reike expert Mrs. Rupa Majmudar & assisted by Mr. Tapan always in great demand at fortnightly Reiki program organized by Ashram. Ashram organizes Paduka Pujan on every Thursday morning from 8:30 am to9: 30am, & weekly Satsang on every Sunday from 9am to10am led by Dr. M.J.Patani Saheb. Daily satsang at ashram is being conducted everyday 9pm to 9:45 pm invariably, which was conducted by H.H.Sri Swami Shankaranandji Maharaj in absence of worshipful Sri Swami Adhyatmanandaji Maharaj. Devotional music of Mrs. Mayurikanben is a special attraction of the ashram.